Explore International is a Professional Skills Development Centre for Overseas job Aspirants. We have tailor-made Training Modules to take your skills to the next level. We have Gulf experienced and British Council certified Faculties to get you that extra edge in soft skills and Personal Excellence. We have experienced and certified faculties for IELTS coaching. Explore International is a one-stop Online Service Centre for various Educational and Visa-travel related requirements. We provide Business Set-up consultancy for Dubai and visa assistance for Investor, Employment and Family. UAE Employment Visa Procedures at Consulate: You can approach us for the smooth documentation and facilities in Thiruvananthapuram. Our package includes: pick from your arrival point (Railway/Bus Stand), Accommodation, Medical (if required), Medical Certificate Attestation using our Credit Card without you standing in the queue, necessary guidance and drop at your travel point. � Education Certificate Attestation for UAE visa purpose. � Marriage certificates and Birth Certificates attestation for family visa purpose in UAE. � Kerala Home Department Attestation for Consulate/Embassy requirements. � Business Set-up Consultancy Service for Dubai, UAE. 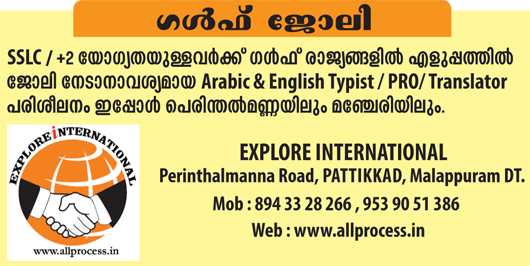 2nd Floor, City Tower, Pandikkad Road, MANJERI, Malappuram Dt., Kerala, India. UAE Exchange Building, Al Shaab Colony, Hor Al Anz, Deira, Dubai, U.A.E.